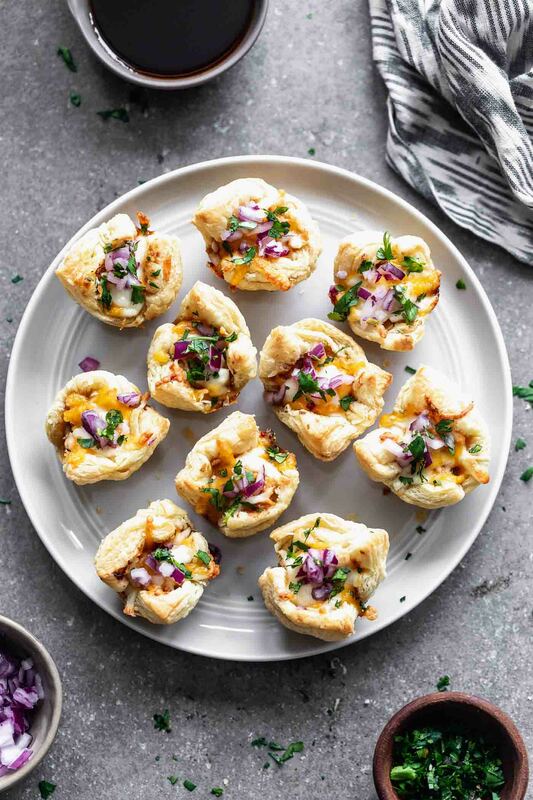 Cheesy Barbecue Chicken Bites: Chopped chicken tossed in your favorite barbecue sauce, covered in cheese and served with chopped red onion and cilantro. 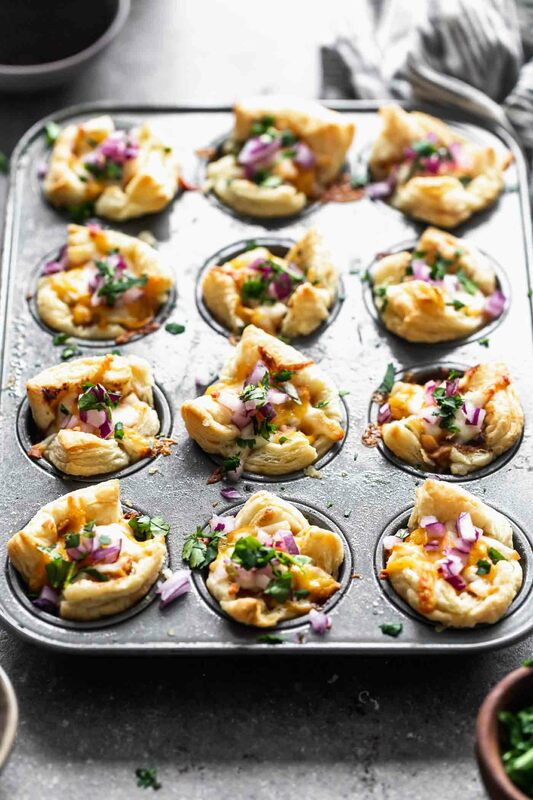 The perfect bite-sized appetizer for a crowd! 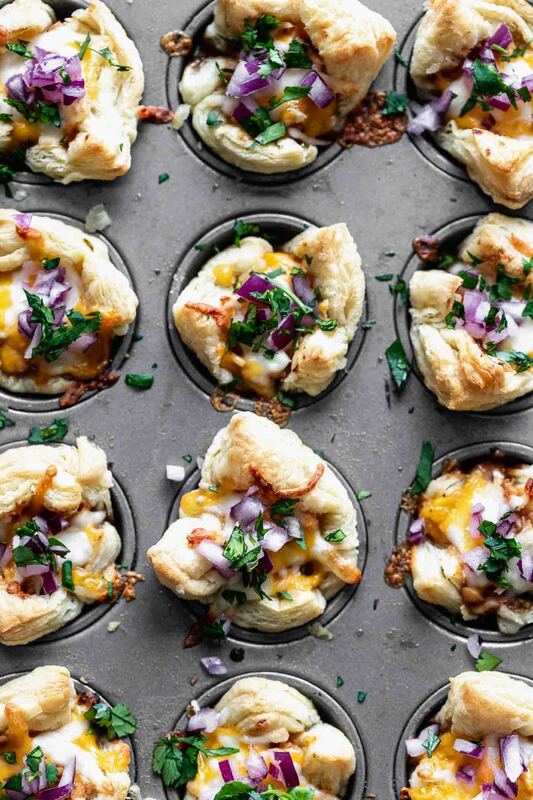 When barbecue chicken pizza meets delightfully airy and crispy puff pastry, you have a match made in heaven friends. 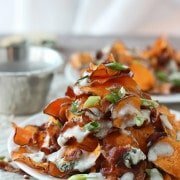 And the perfect Game Day appetizer that just may be even be better than those addictive piggies in a blanket we’re all suckers for. But gosh I do love those as well. I also happen to be a sucker for barbecue chicken pizza, so it only makes sense to condense it into a bite-sized version of itself perfectly fit for parties. 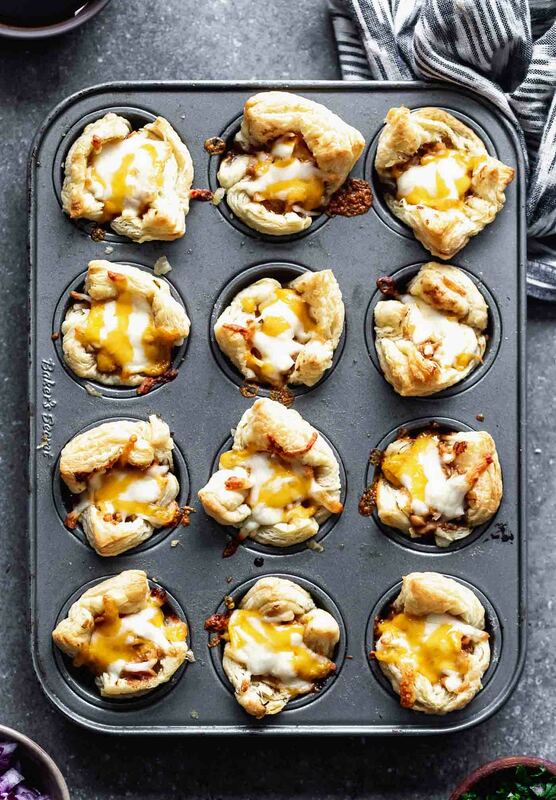 In a nutshell, this is what’s happening: Chopped chicken is tossed in barbecue sauce and sour cream, nestled into partially cooked puff pastry shells, and covered in a mix of gooey mozzarella and cheddar. 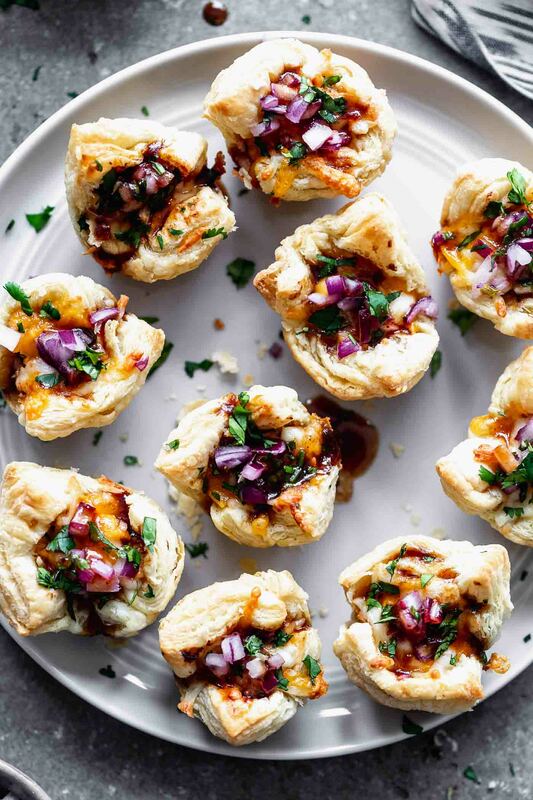 They’re topped off with another drizzle of barbecue sauce, some chopped red onion and cilantro, and ready to be served. I say you need store-bought rotisserie chicken, but I had a bunch of leftover roasted chicken tenders from a previous dish, so that’s what I used. If you already have chicken on hand, just use that up, otherwise, no need to spend the time to cook chicken yourself. 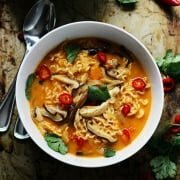 You will have leftovers if you go this route, but they can be easily repurposed just use for your (aka my) favorite chicken noodle soup or quesadillas later in the week. The barbecue sauce is important, obviously. 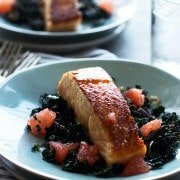 It’s what flavors essentially the entire recipe, so you want to use something you love. I prefer a tangier, thinner barbecue sauce from this local KC restaurant, but if you’re not local, you can buy it here. The sauce comes into play two ways. First, tossed with chopped chicken and sour cream for the filling. Second, drizzle on top of the cooked bites after they come out of the oven. The double dose ensures maximum barbecue flavor in each bite, so don’t skip it! 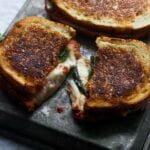 I went with a combination of mozzarella and cheddar since that’s what I had on hand, but gouda, Monterrey jack or any other cheese that melts well would be great. I love puff pastry for some many reasons, but first and foremost, it’s delicious. I also love how easy it is to work with, and the fact that it’s basically a blank canvas for whatever your heart desires. Cooking it in this particular recipe requires two different steps. First, it’s nestled into a mini muffin tin and partially baked just until it starts to turn golden brown. Because the chicken is already cooked, you really don’t want it in for as long as it takes the puff pastry to cook, since it will most likely dry out. The only problem, is puff pastry has a tendency to…puff. Imagine that. So after the first round of baking, I take a teaspoon and basically compress the bottom and sides so the filling can fit inside. 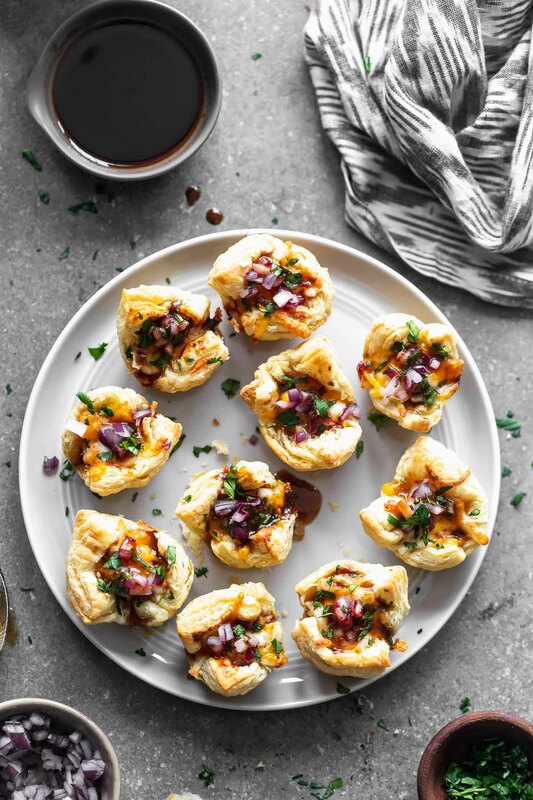 After the bites are done baking, they’re drizzled with more barbecue sauce, sprinkled with plenty of red onion and cilantro and ready to be served. I like to serve them warm, but they’re also delicious at room temperature. Preheat oven to 400 degrees. 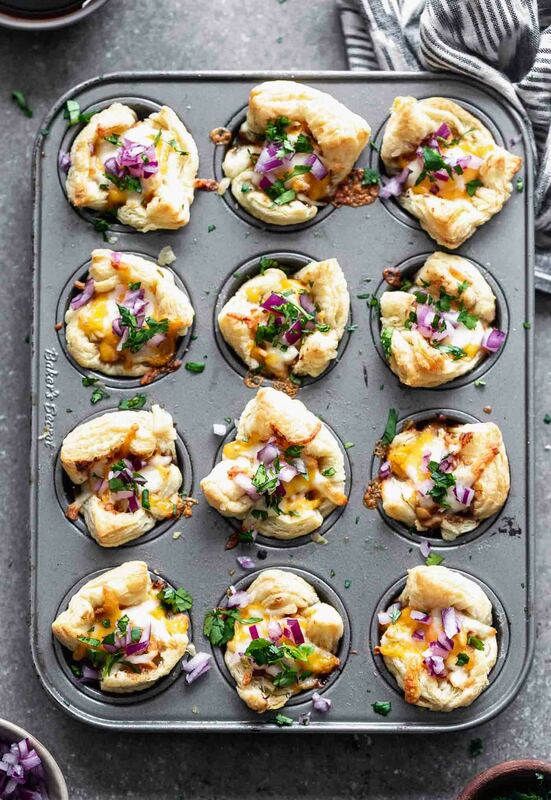 Grease a mini muffin tin with non-stick cooking spray. Slightly roll out puff pastry with a rolling pin. Cut into 12 squares. 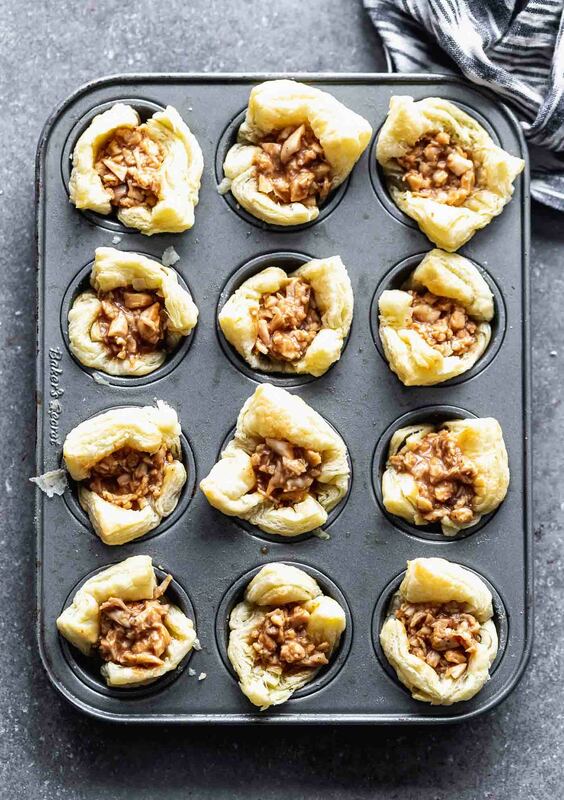 Nestle into mini muffin tins. Bake in the oven for 8 minutes. While the puff pastry cooks, add chicken, 1/4 cup barbecue sauce, and sour cream to a small bowl. Toss to combine. Season with salt and pepper. 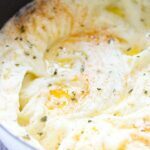 Pull the puff pastry out after cooking 8 minutes in the oven. Use a teaspoon to push the puff pastry down on the bottom and around the sides, creating a hollow area for the chicken to go in. Evenly divide the chicken between the puff pastry. Sprinkle with cheese. Bake another 8-10 minutes until the cheese is melted and the puff pastry is golden brown. 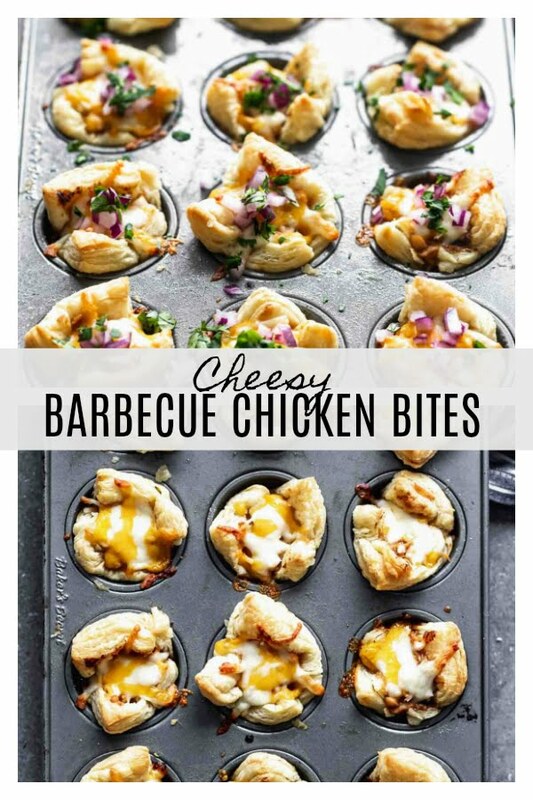 2 Responses to "Cheesy Barbecue Chicken Bites"
Love this! This will definitely be a crowd pleaser for sure! 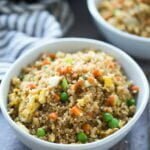 Making it for superbowl party! !+ yum! !